A recent interview about the social media wars published at the Tribune (with the international New York Times). War and conflict is no longer limited to battlefields. Every battle on the ground — whether it is for land, ideology or power — now has an equally strong and effective virtual dimension. In fact, even before you read this story, you may have seen hundreds of tweets, images and videos from the protests in Hong Kong. Some of you may have watched the Arab Spring unfold on Twitter as it happened, or winced in pain as your Facebook timeline flooded with updates or tweets from Gaza and Syria. This is an indication of the start of a digital battle in which each of us has a decisive role to play. 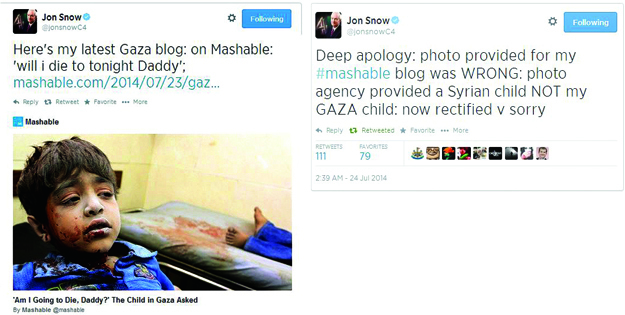 A tweet by Channel 4 anchor, Jon Snow that incorrectly identified a Syrian child as a Gaza victim. He later apologized for it. Social media has turned everyone into a stakeholder in events that are taking place thousands of miles away. The fact that most of us are now completely in sync and vested in events that occur in parts of the world that we previously had little familiarity or access to is perhaps the biggest testimony to its power. And this power can be a game changer, depending on how it is utilized. The revolution shall be tweeted? 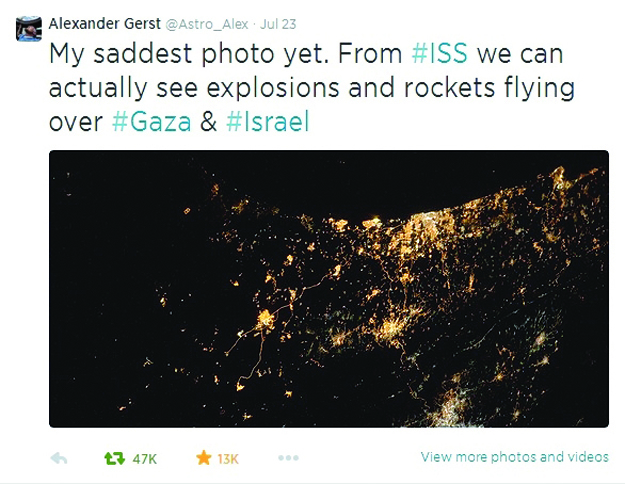 One of the most recent events that took social media by storm was the launch of Operation Protective Edge by Israel in July this year. According to the Gaza Ministry of Health, the operation claimed 1,951 Palestinian lives over a period of seven weeks. The Israel army website and agencies on the other hand show the loss of 67 lives on their side. Globally, the operation was seen as a one-sided display of brute power by the Israeli Defence Forces and led to a backlash against their actions. On the other hand, there was an outpour of support and sympathy for the residents of Gaza, who were seen as victims of the conflict. While this contrast in public opinion was hard to gauge on traditional media outlets — most of which either portrayed the conflict as a clash between two equal forces or used Hamas to justify Israeli attacks on the civilian population — the stance was much clearer on social media. Users from all across the world condemned Israel’s inhuman actions and pleaded to international bodies to intervene and provide protection to the Palestinians. According to Al Jazeera, the hashtag #GazaUnderAttack was used four million times during this period whereas the hashtag #IsraelUnderFire was used only 200,000 times. “These types of conflicts have a tendency to cluster in ‘party lines’,” said Dr Nir T Boms, a research fellow at Tel Aviv University and the co-founder of a network of bloggers from The Middle East, during an online interview. He added that this conflict between Palestinians and Israelis is often framed as a clash between Muslims and Jews. “Hence, we may find at least some natural sympathizers among the immediate ‘kinsman’ of these two groups which are not of equal size (There are about 1.3 billion Muslims in the world and only 14 million Jews),” he says in an attempt to explain the wide discrepancy in online support between the two sides. Even though Twitter had played an important role during the eight-day Operation Pillar on Defense in 2012 as well when IDF forces had attacked the Gaza strip, its intensity was far greater this time. Even the two warring factions, IDF and Hamas, posted updates, tweets and videos in an attempt to win hearts and minds. 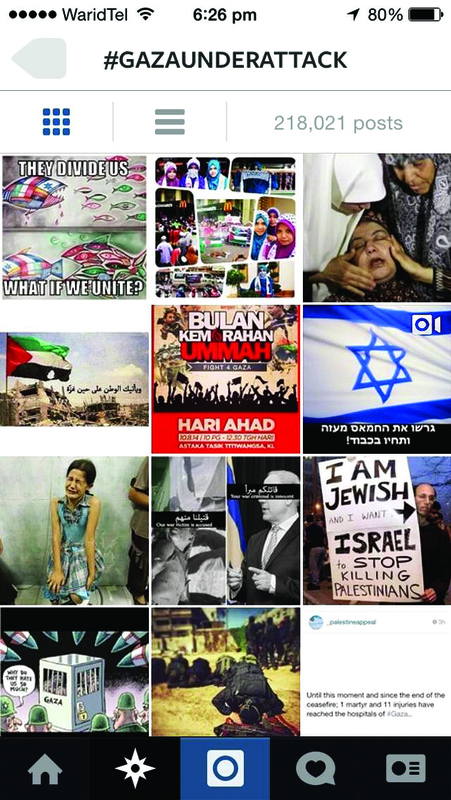 The impact of social media has not just been limited to the Gaza conflict. Previously, the protests that broke out all across the Muslim world from 2010 to 2012 were also widely documented on Facebook, Twitter, YouTube and Instagram. The death and destruction that has ravaged Syria for the past three years also made its way to eyes and ears across the world due to these platforms. 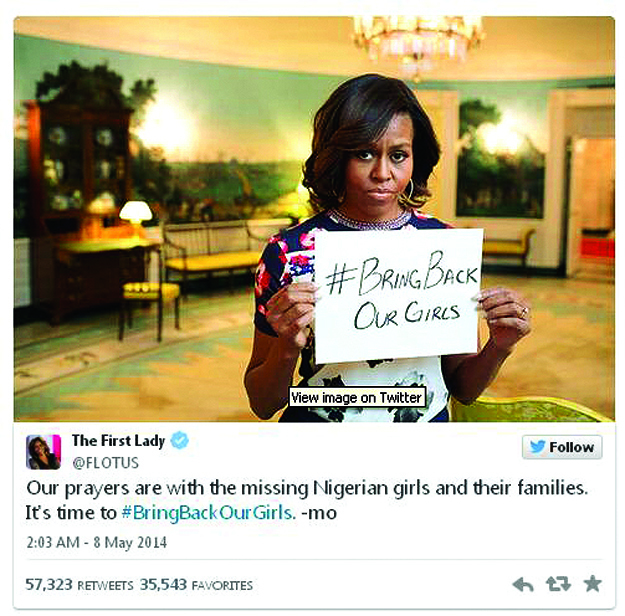 The plight of the 276 schoolgirls that were kidnapped by Boko Haram in Nigeria also picked up momentum through social media. Despite attempts by the government to control information, images, tweets and videos coming out of Hong Kong these days has given the world an insight into the country’s struggle for democracy. In Pakistan, tweets and Facebook videos have been used as evidence against the alleged rigging of the 2013 elections and to solicit support in favour of and against political parties. Any powerful tool, if used excessively or without checks and balances, has the potential to backfire. Social media is no exception. While it has filled up the information gaps that may be overlooked (consciously or otherwise) by traditional media outlets and made it impossible for those in power to control or distort news to serve their agendas, it can also lead to misinformation, panic and hatemongering. The speed at which information is transmitted in the virtual world often makes it difficult to distinguish between facts and speculation. 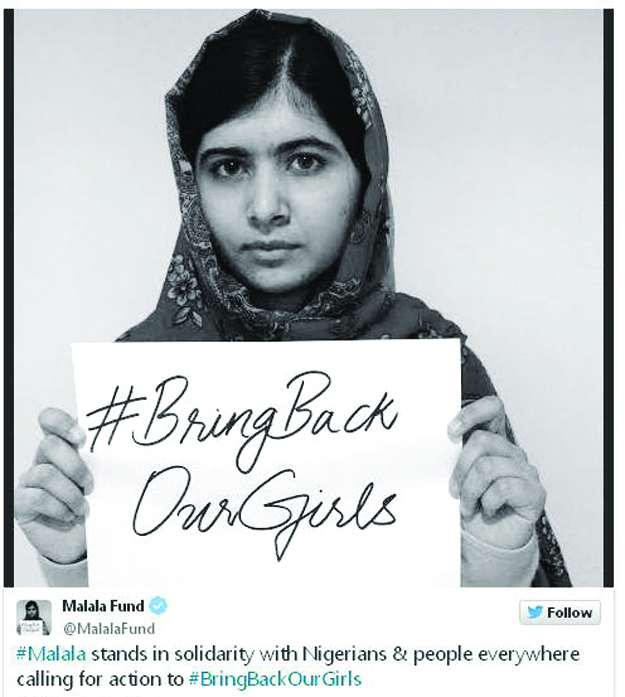 For example, an image of a girl with tears in her eyes that was circulated widely on social media during the ‘Bring Back Our Girls’ campaign eventually turned out to be fake. 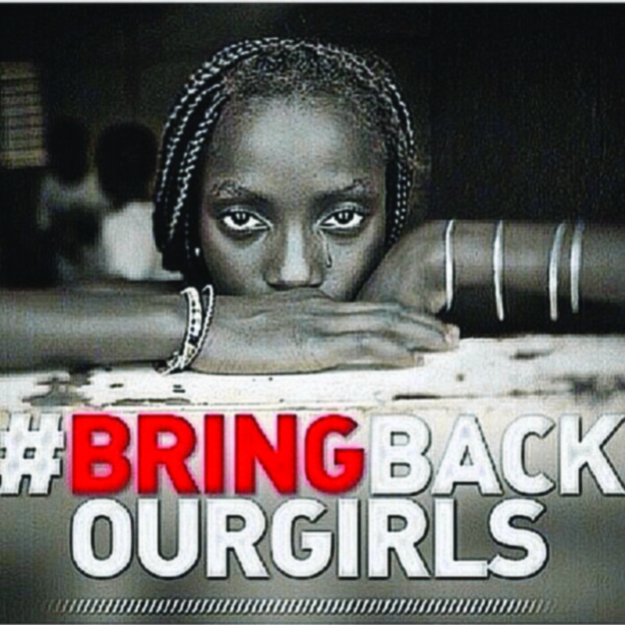 The girl in the picture was not from Nigeria and her tears were photoshopped. By the time this loophole was pointed out, celebrities such as Chris Brown, Kim Kardashian and even the US embassy in Madrid had already shared the image. Similarly, pictures of Syrian war victims were also circulated widely on social media, captioned as victims of Israeli violence. Jon Snow, an anchor on Channel 4, also tweeted the picture of a Syrian child mistaking him for a child in Gaza and apologised for the error later.